This post is sponsored by Chef’d but all the opinions are 100% my own. I have heard people who are part of subscription meal kits complain that they don’t like the choices and are forced to pick one. Those days are over thanks to a new service Chef’d. 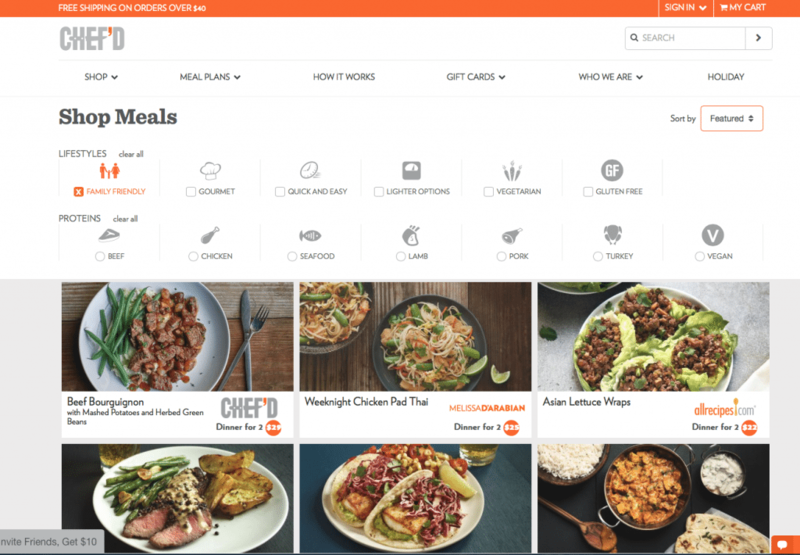 Chef’d is the first and only online meal kit marketplace with no membership or subscription fees; you order the recipes you want, when you want them, and all of the fresh, pre-portioned ingredients will arrive at your door within 48 hours! 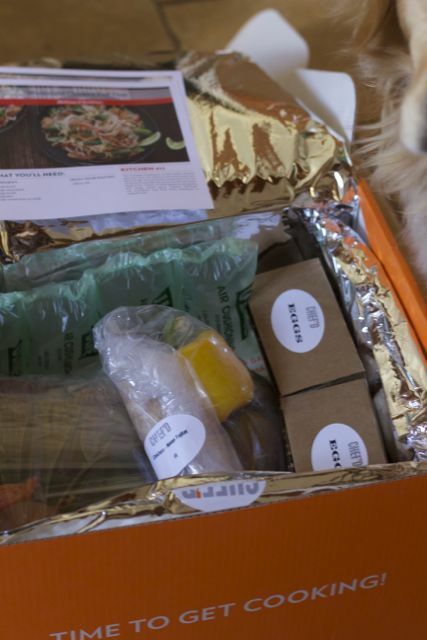 I had tried a few different meal kit services in the past, and I was overwhelmed with the number of recipes from chefs and magazinesI was already familiar with. How often have I searched meals on Allrecipes and had to write down the grocery list, or have skipped recipes because I did not want to buy a full container of an obscure spice. 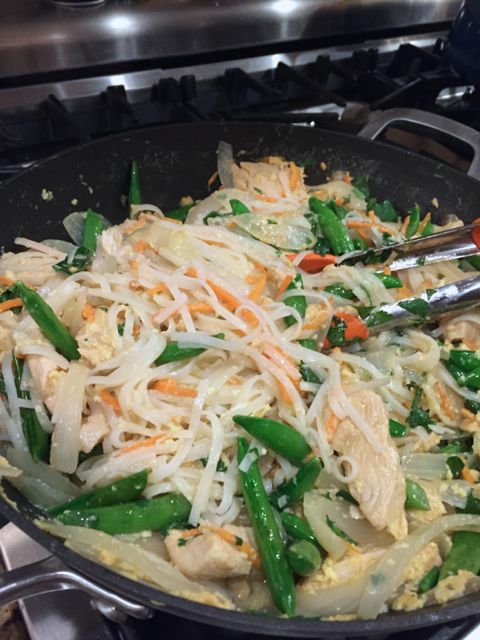 You can easily choose from family friendly, gourmet, Atkins or weight watchers recipes to just name a few. There are other criteria you can narrow down your search with. Most recipes have reviews as well so you have a sense of what other people thought. You can also add on dessert and breakfast options too. Now all you have to do is order it from Chef’d. The recipes come in servings of 2 or 4 people. Chloe is very curious as to what smells are coming from the box. 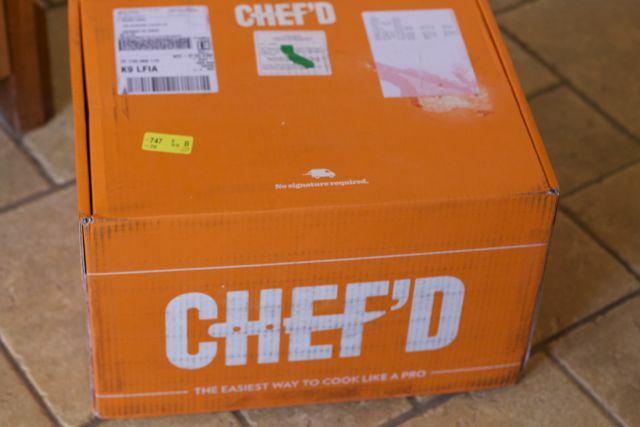 They come in a bright orange box and are the ingredients are bagged per recipe. Like other meal kits there is a photo recipe / instruction card too. 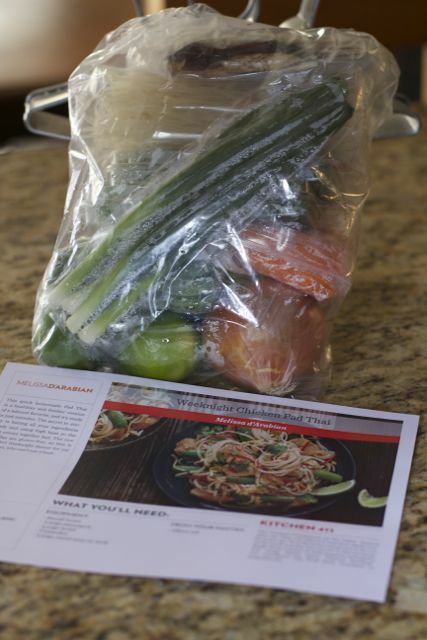 All your ingredients for each meal are packed in one separate bag. We had chicken Pad Thai for our first meal. I think it came out great and the kids liked it too. They thought it was too citrusy so I would reduce the number of limes in the marinade. 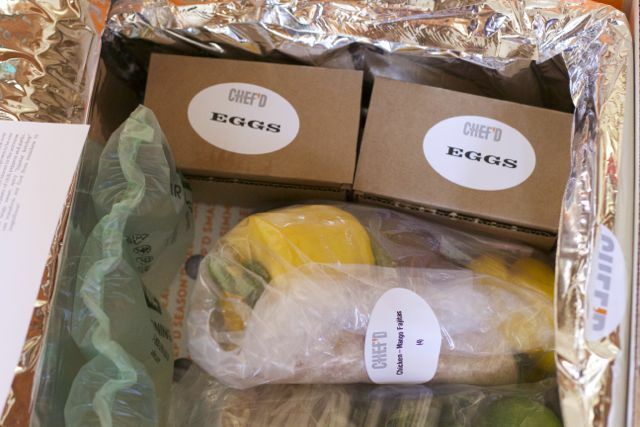 I am thinking next time my husband and I go out of town, I will be ordering our online meal kit from Chef’d for the overnight sitter. It could not be simpler and more convenient. Now it’s time for you to try Chef’d for free. We are offering a giveaway for one of our readers, (U.S. only) to receive a $25 Chef’d gift card! Enter the Rafflecopter below. Wow, so much to choose from, and they are fast and easy to use and get. They have many tasty meals that are easy to use, convenient and time savers. They have a great selection of kinds of meals that are nutritious and filling. The largest marketplace for meal kits on the web with over 350 recipes to pick from and enjoy. Partnered with dozens of chefs for very tasty meals. I love all the different options! I like that there’s no subscription. I like that they are delivered fresh and that you don’t have to have a subscription for it. I really like the variety of meal plans to choose from! I love that you can choose from Famous Recipes. I like they ship fresh, pre-portioned ingredients to your door in a well insulated and temperature controlled box. i like that theres no subscription to cancel! thats amazing! I like that there is no subscription. I really like that they do Weight Watchers meal plans! I like the fact your not commited to buying over and over.it is great just buy what you want at that time. I like that they offer high quality ingredients and that there’s a nice variety of types of cuisine and ones for when I’m on a diet. I like that there’s no subscription and that these are chef created meals. I like that that Chef’d offers meals for all diets, including Atkins and Weight Watchers. I like the idea of making restaurant quality food easily during the week. I like that they deliver fresh, pre-portioned ingredients in a well insulated and temperature controlled box and that it contains everything you need to make a delicious meal. I wish this was offered in Canada. 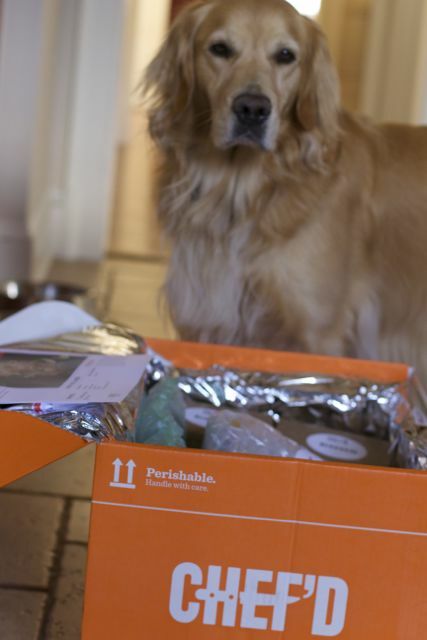 I’ve been seeing a lot of fun foodie boxes, but none of them seems to deliver here. I do like that they ship fresh, pre-portioned ingredients to our door in a well insulated and temperature controlled box. This sounds fun and convenient. I love that it’s so easy. my SIL loves this kind of service, I hadn’t thought of it unti now but this would be a good gift idea. I love how all of the ingredients look fresh, and everything comes with easy cooking instructions. I never seem to have all the ingredients I need when I make something and I love how Chef’d comes with everything you will need. Woah!!!! Who would of thought something sent to you would look so yummy and fresh!!!! I need to check out chef’d! Wow, it all looks so fresh! 🙂 I would definitely love to try this! I’m really impressed that they don’t charge subscription fees. Sounds like a great idea for prepping meals in short order. 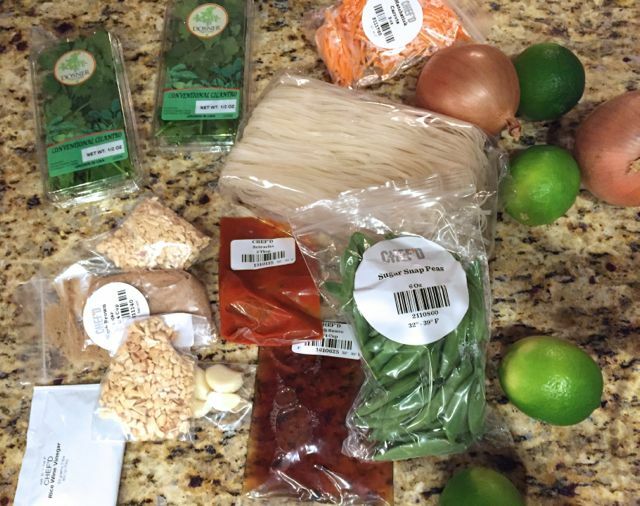 So far I have tried Home Chef and Hello Fresh and while I’ve been pleased with the food without the discount y you get for trying them the first time they are too expensive. I love that Chef’d doesn’t have a subscription or membership. I love these meal kits- especially this time of year. SO much easier to have it all packaged up for ooking! This is my first time to heard about Chef D and it’s sounds great! I wish they can also ship to Canada that would e awesome!